Praktizierende Zahnärzte, Hochschullehrer, Wissenschaftler und Mitarbeiter im Gesundheitswesen werden in dieser Zeitschrift eine unverzichtbare Quelle essenzieller, aktueller Informationen zum wissenschaftlichen Fortschritt in den Bereichen Mundgesundheit, Kariesprävention, Parodontalerkrankungen, Mundschleimhauterkrankungen und Zahntrauma finden. In fachlich begutachteten Beiträgen, wie Berichten aus der klinischen und Grundlagenforschung, Literaturübersichten, eingeladenen Schwerpunktartikeln, Kommentaren und Gastbeiträgen sowie Symposiums-, Workshop- und Konferenzpublikationen werden zentrale Fragestellungen zur Mundhygiene, oralen Epidemiologie, Förderung der Mundgesundheit und zum Gesundheitswesen behandelt. Muthu, M. S. / Saikia, Ankita / Aishwarya, H. J. / Balamurugan, A. 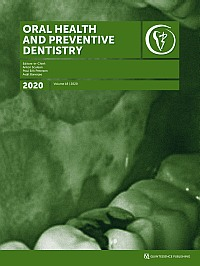 Purpose: This study was designed to assess (i) the prevalence of extrinsic stains in preschool children (ii) the correlation between extrinsic stains and the occurrence of early childhood caries (ECC) (iii) to compare the distribution of caries in pits and fissures, smooth surfaces or both among children with and without extrinsic stains. Methods: A cross-sectional study was carried out among 1,486 children aged 0-3 years. Extrinsic stain and ECC were scored by two calibrated examiners. Correlation between ECC pattern and extrinsic stains was analysed by logistic regression. Caries distribution in fissures, smooth surfaces or both were analysed using Mann Whitney test and Pearson chi-squared test. Results: The prevalence of extrinsic stains among 0-3 years children was 6.2%. Children with extrinsic stain had a 1.13-fold greater chance of exhibiting ECC (OR = 1.132, 95% CI: 0.739-1.733). Statistically significant differences were found for fissure caries (p <0.0002) and both smooth surface and fissure caries (p <0.0328) among children in both groups. Conclusions: Occurrence of ECC appears to have surface-specific variations in children with and without extrinsic stains. However, the interaction of these individual factors and their impact on oral health outcomes needs to be identified through further research. Purpose: This questionnaire survey aimed to analyse management strategies for erosive tooth wear and to identify factors influencing dentists' decision-making. Materials and Methods: A questionnaire presenting clinical cases with erosive tooth wear on anterior and posterior teeth (BEWE scores 1 to 3) was sent electronically to German dentists (n = 13.683). Statistical analysis was performed by Wilcoxon signed-rank tests, Kruskal-Wallis-tests and Fisher's exact tests (p <0.05). Results: Only 455 dentists (3.3%, mean age: 52.3 ± 9.6) participated. Suggested therapeutic measures were statistically significantly different between BEWE 1, 2 and 3 (p <0.001) and between anterior and posterior teeth with BEWE scores 1 or 2 (p ≤0.025). Initial erosive lesions (BEWE 1) were mainly treated by information about the main causes and/or preventive measures (posterior teeth: 75.6%, anterior teeth: 64.4%), only 20.0% and 31.3% considered restorative treatment for posterior and anterior teeth, respectively. For teeth presenting score 2, a very high proportion of dentists considered restorative treatment (posterior teeth: 60.6%) additionally to prevention, especially when anterior teeth (91.0%) were affected. In case of severe erosive lesions (BEWE 3), the vast majority of dentists considered restorative treatment (posterior teeth: 98.3%, anterior teeth: 99.8%). The decision-making was mainly dependent on the lesion depth, size of affected surfaces and the presence of pain. Fluoride agents and agents containing tin chloride or tin fluoride were most frequently recommended as preventive measures. If distinct defects (BEWE 2) were treated restoratively, mainly composite restorations were performed (posterior teeth: 72.0%, anterior teeth: 90.5%). Severe defects (BEWE 3) were mostly restored with ceramic restorations (posterior teeth: 66.1%, anterior teeth: 66.6%). Conclusion: Stepwise management of erosive tooth wear was observed. Dentists' decision-making was related to severity and localisation of erosive tooth wear and to various patient-related factors (e.g. depth of lesion and size of affected surface per tooth).